In the wake of Canada’s most divisive election ever, Prime Minister Sir Robert Borden headed south to Hot Springs, Virginia for a brief holiday. 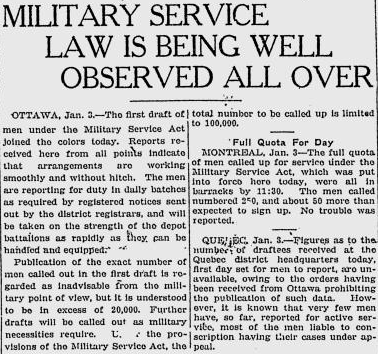 But just before leaving Ottawa, he finally confirmed the long-awaited order for the first class of conscripts to report – single men or widowers without children, aged twenty to thirty-four, and not in possession of an exemption. The call-out began on 3 January 1918, and on that day draftees began to make their way to twelve depot battalions across the country. About 18,000 men of the first class were available to be recruited on the start date, although the initial flow at individual depots would be limited to 200 or less per day. In Toronto the quota that first day was for 270 men, but apparently just 200 "answered the call"—the next day only 110 out of 260. Here was evidence of ongoing public resistance to compulsory service, except that now all those who were called and did not report were considered absent without leave—therefore "defaulters" and subject to military law. Lest there be any doubt in that regard, the Military Service Council decided "to publish the names of those men who fail[ed] to report," thus providing the first hard proof that "conscription had been reduced" to what Desmond Morton described as "a punishment for 'slackers.’"
*"Bugle Calls Up Draftees," The Globe, 3 January, 1918, 1; and Desmond Morton, A Military History of Canada (Edmonton: Hurtig, 1985), 156.